If you have never received your PCARS Membership Certificate or Badge, I will probably have it with me at the PCARS Cruise in this coming Thursday night, or, at the BBQSO Party on Saturday (I will be there mostly in the afternoon). I would be happy for you to pick it up from me there. I’m hoping that you will be able to attend at least one, of not both of these PCARS activities! Hope to see you all there. I received a reminder from the Ohio QSO Party Activity Whip – Dan W8CAR. I thought it was pretty good, so I copied some of it here for you. Here’s your chance to be the Hunted and not the Hunter. 1) Check out the radios we have at the club site. 2) Football preseason games are a waste. 7) Come and have some good BBQ Burgers & Dogs and fellowship with your fellow members. Bring a dish to pass around. 9) Did I mention “BIG FUN!!”? Come on out and help your fellow PCARS members put K8BF (KILO 8 BIG FUN) on the air. We’ll keep a light on for you. Here’s the Minutes from the July club meeting. 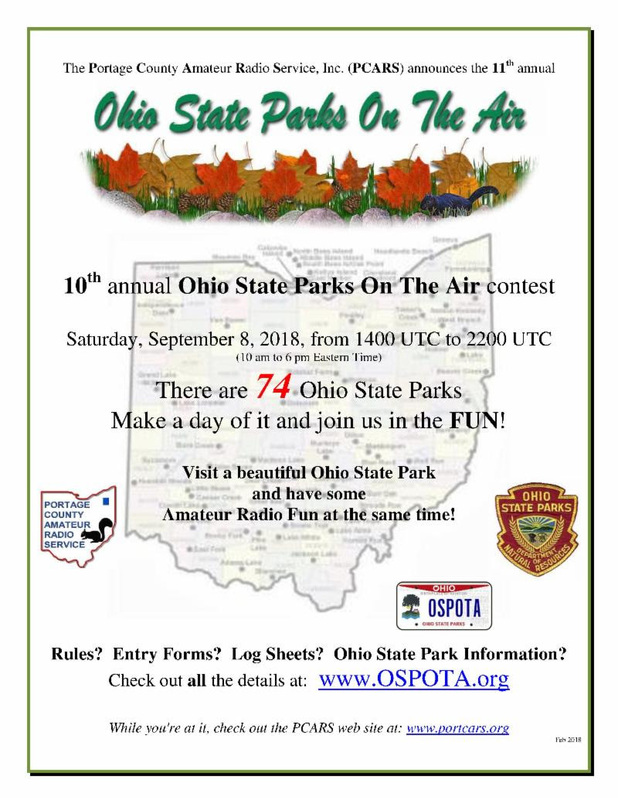 It’s time to plan to visit one of our great Ohio State parks and have a little contest fun.Mark this date September 8th on your calendar and visit www.OSPOTA.org for all the details. For those volunteers who will also be participating in OSPOTA, please let me know that in your e-mail to me so I can plug you into the earliest available time slots. The PCARS Newsletter won FIRST place in the Ohio ARRL Section Newsletter competition for 2018. 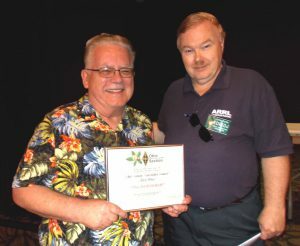 The award was presented on August 4th at the ARRL Ohio Section Conference held in Grove City, Ohio. 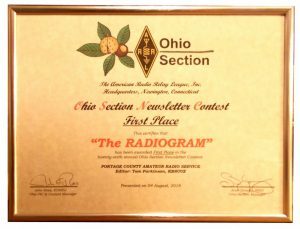 The RADIOGRAM was chosen as the First Place Winner. Lots of PCARS FUN is coming up in the near future! Coming up on Monday August 6th is the monthly PCARS Officers Meeting – 7:00PM at the clubsite. All PCARS members are always welcome to attend these meetings. The following Monday, August 13, is the PCARS Monthly General Meeting – 7:00PM at the Kent American Legion Hall. This month’s featured speaker will be Tim Duffy – K3LR. Tim is an accomplished ham radio operator, contester, and station builder! Tim will be talking about his personal experiences with Ham Radio and especially the K3LR Contest Station. Don’t forget – All PCARS members are invited to the K3LR station on Saturday September 15 for a tour. On Thursday, August 23rd, the monthly Net Night at the Clubsite will be replaced with our annual PCARS Mobile Cruise In at the Ravenna A&W. Cruise in starts at 6:00PM. Come on out for dinner and a really good time! The PCARS weekly net will be run from the cruise in, so even if you can’t attend you can still check in to participate in the FUN! Saturday, August 25th is the Ohio QSO Party and of course, the PCARS annual BBQSO Party at the clubsite! The QSO party starts at 11:00 AM through midnight. The BBQ will be served at approximately 3:00 PM. Come on out, get on the air, have some good summer cookout food and enjoy the fellowship! If you want to have Ham Radio Fun be sure to come out and participate! PS: Still looking for someone to step up and take on the PCARS Secretary position. Why not you?